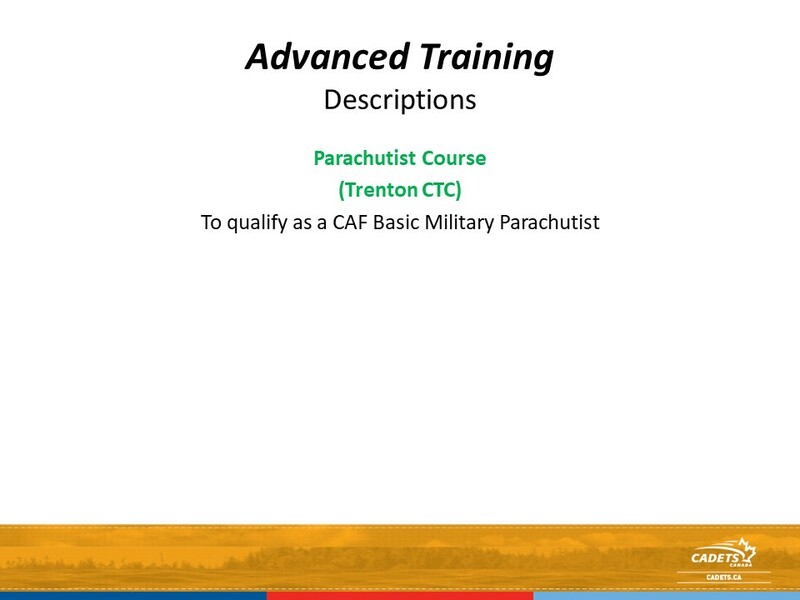 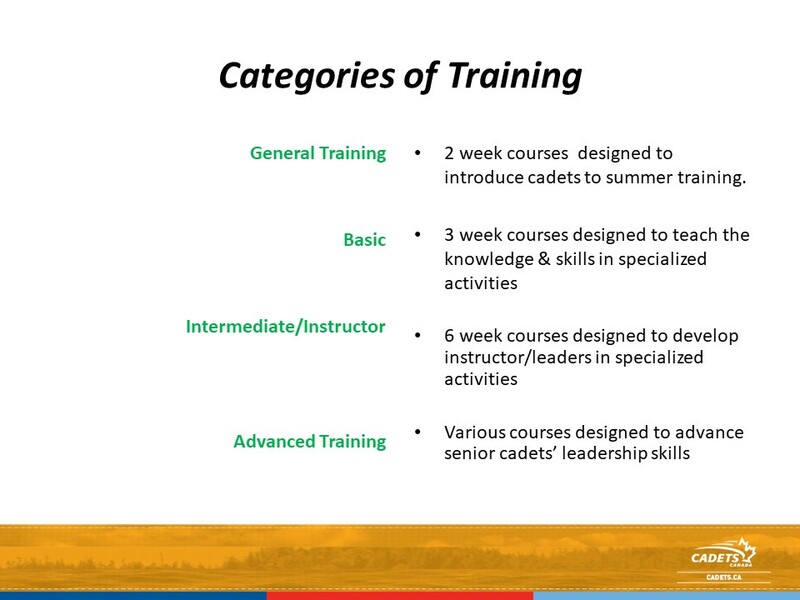 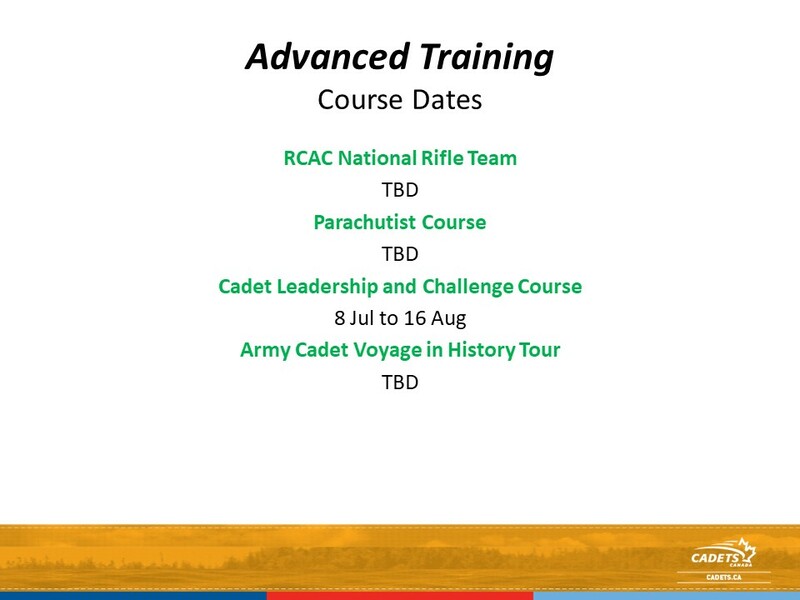 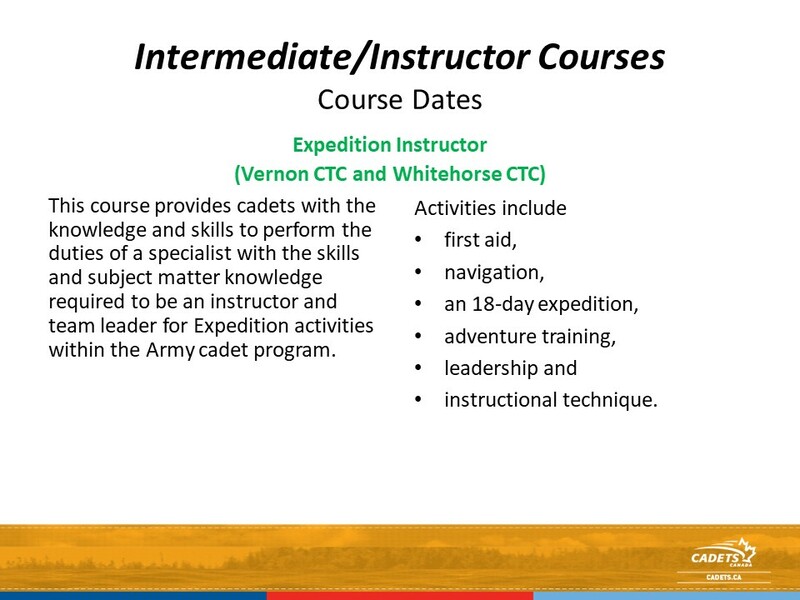 Training during the months of July & August at one of our many Cadet Training Centres. 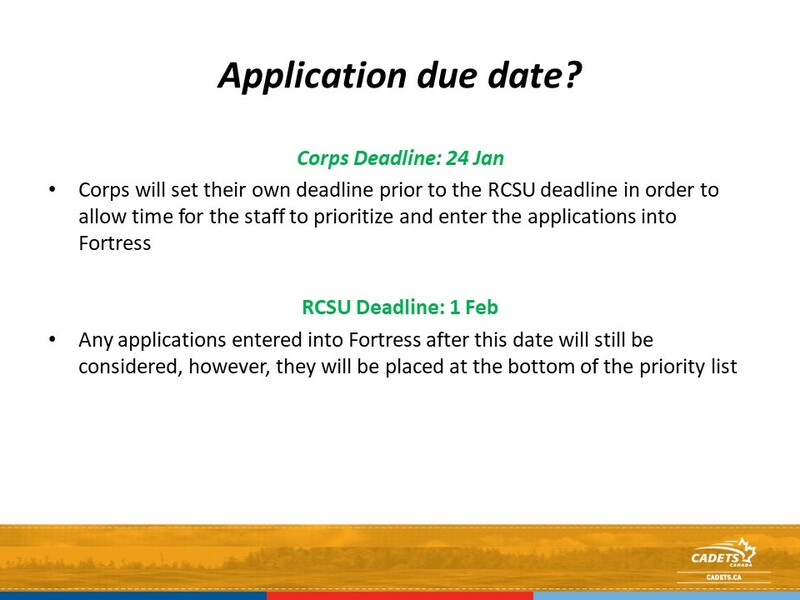 NOW ACCEPTING APPLICATIONS Submit your application at the bottom of this page. 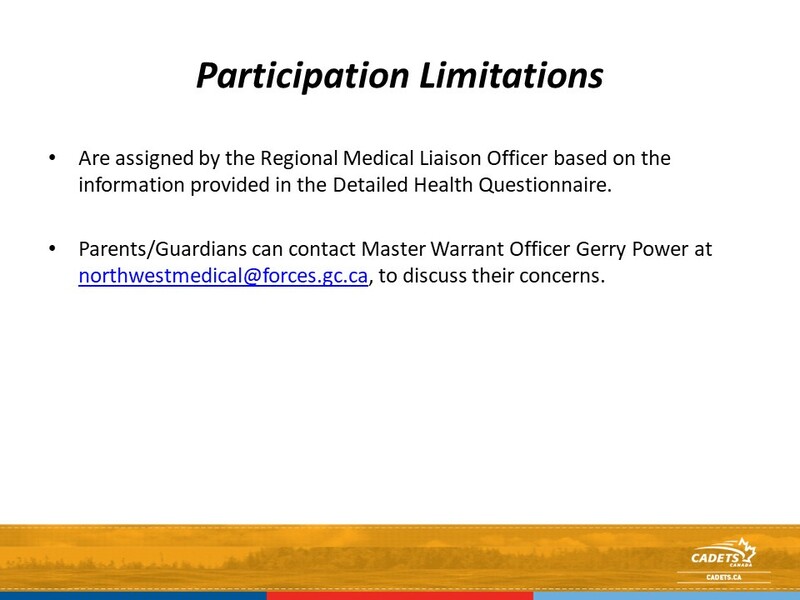 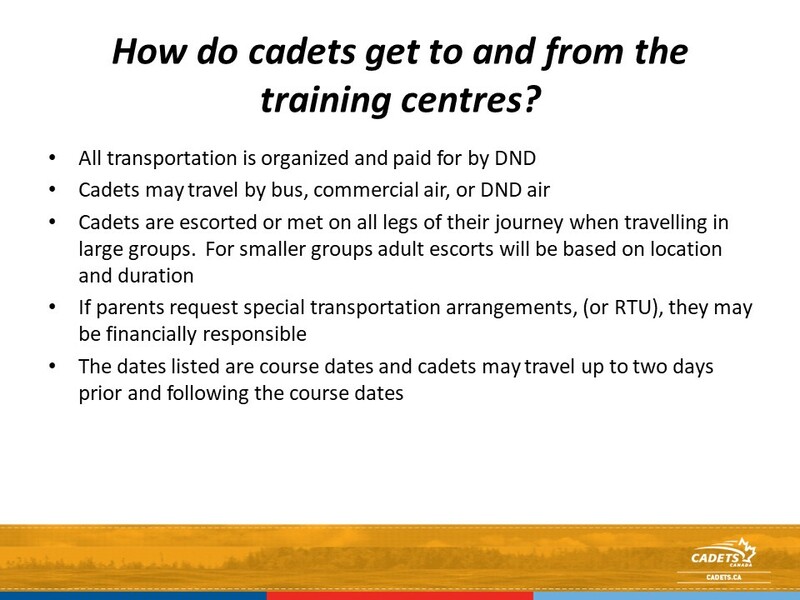 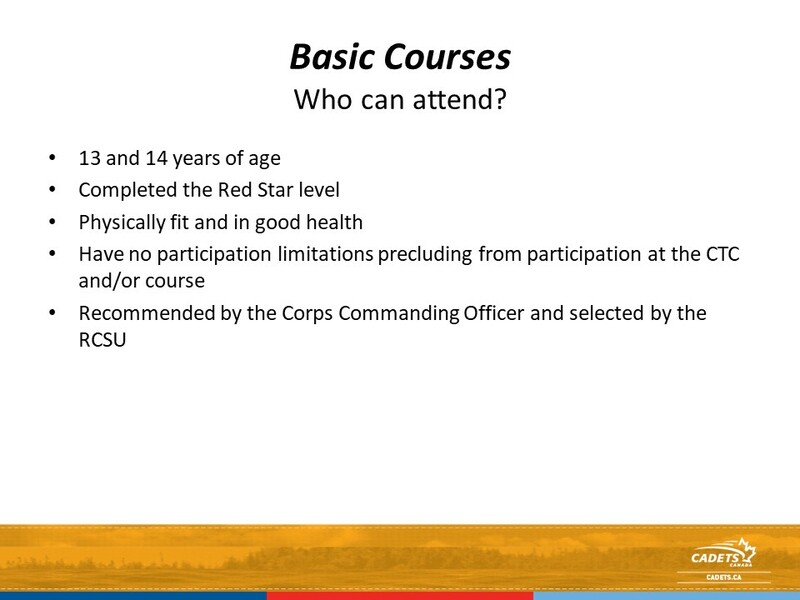 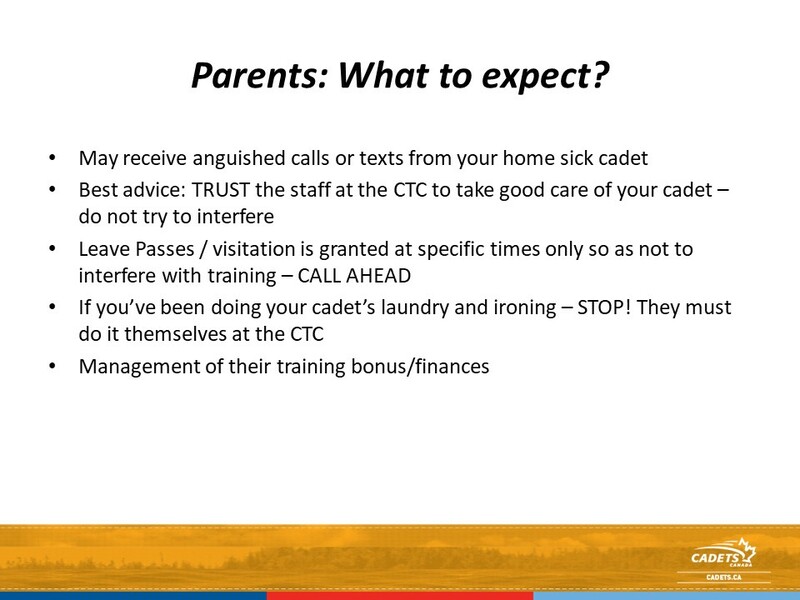 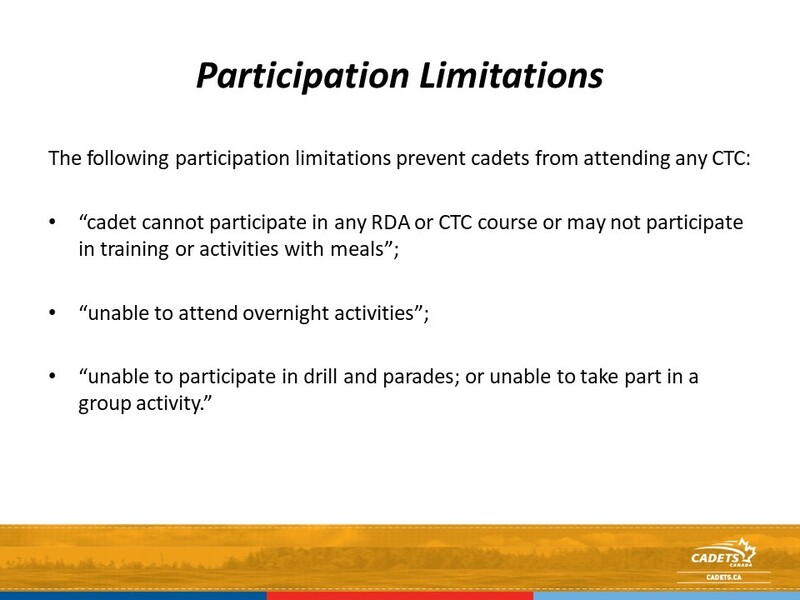 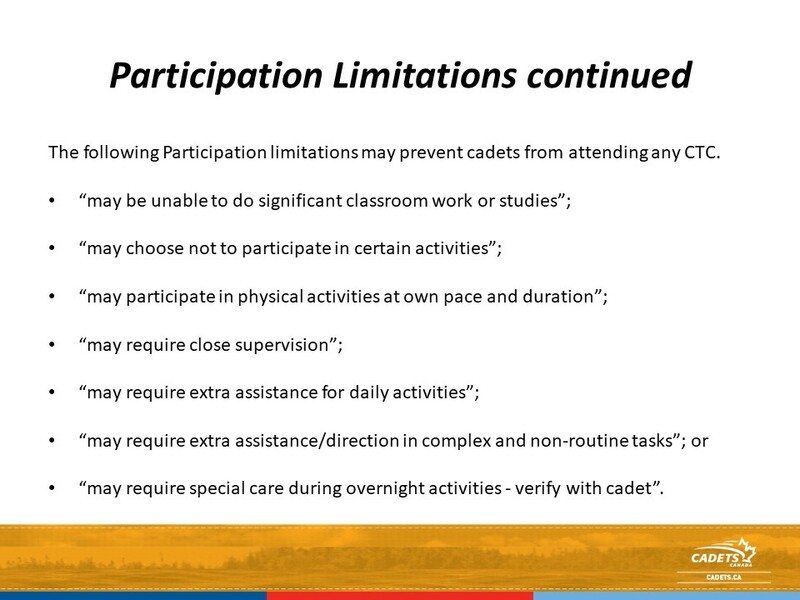 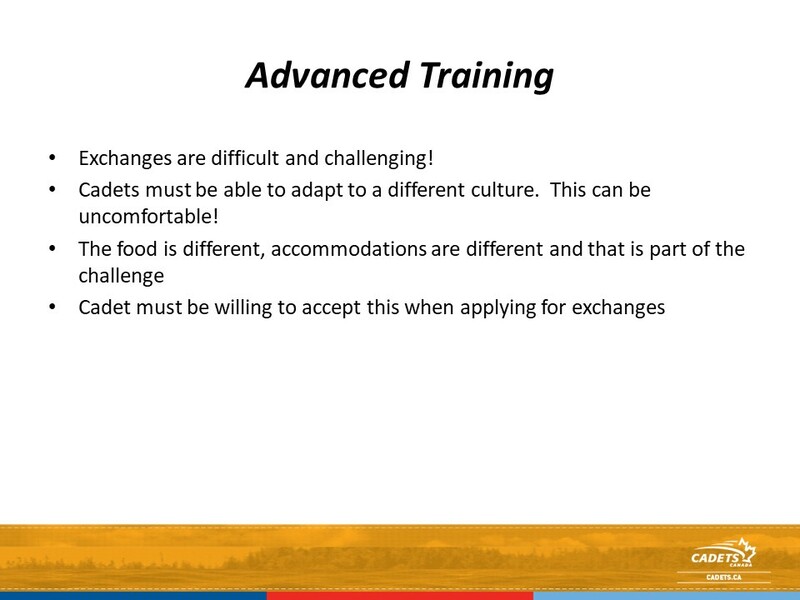 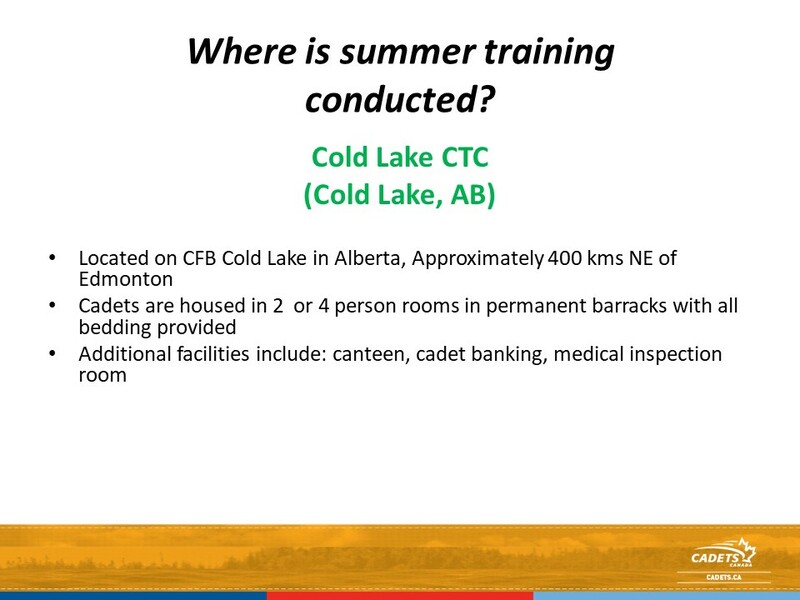 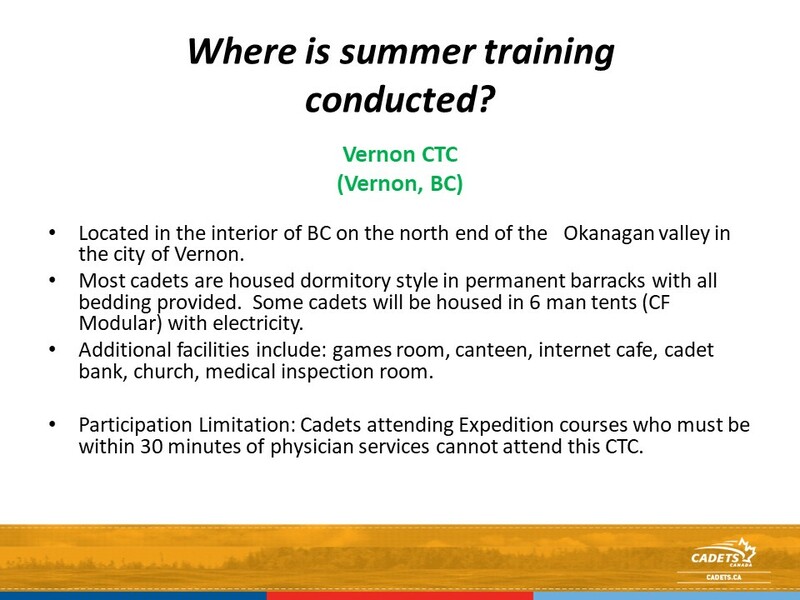 Due to the remote location of some Cadet Training Centres (CTCs), cadets with severe allergies or other medical conditions that may require rapid medical attention may be precluded from attending certain courses. 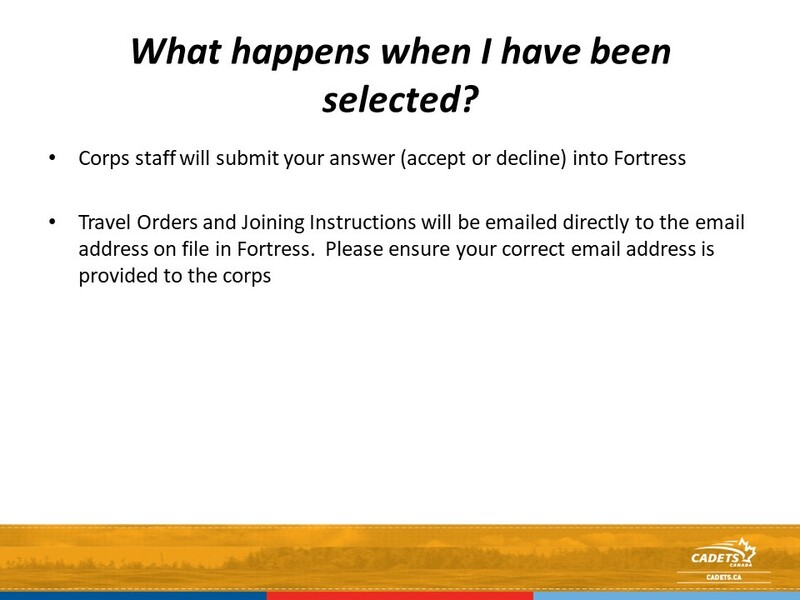 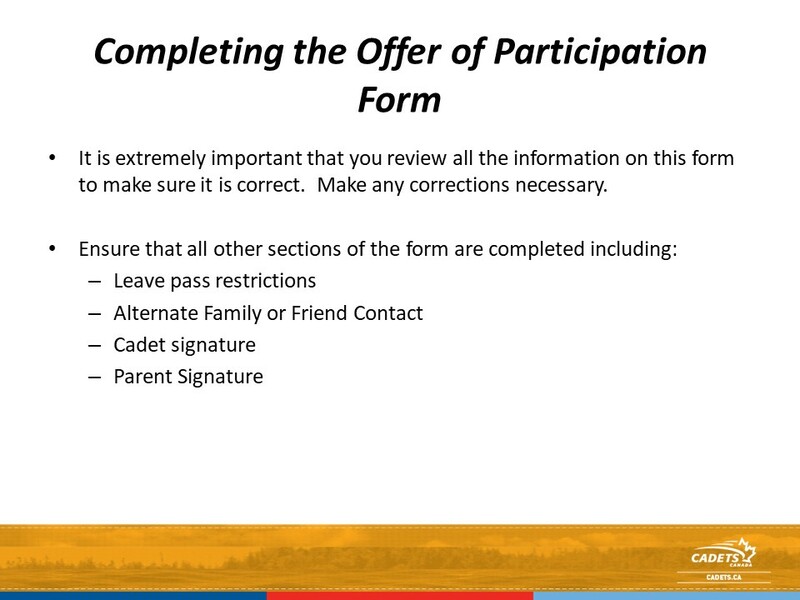 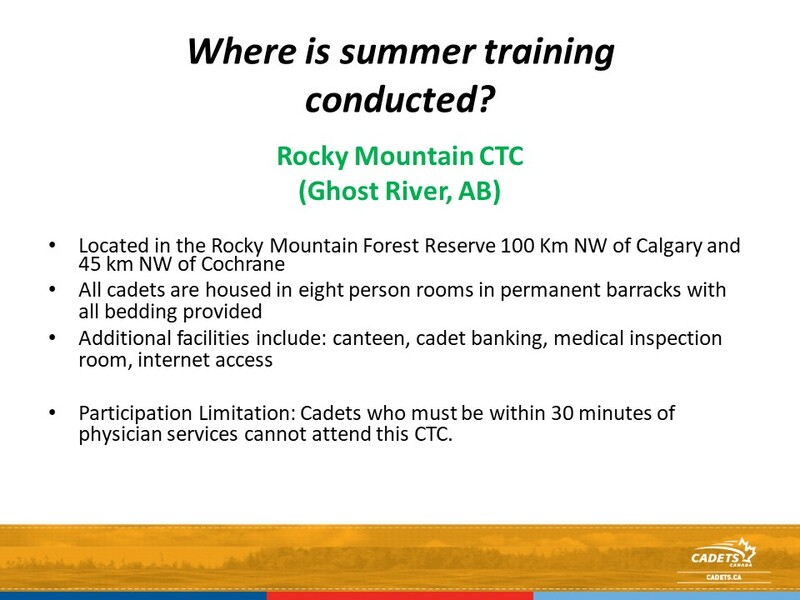 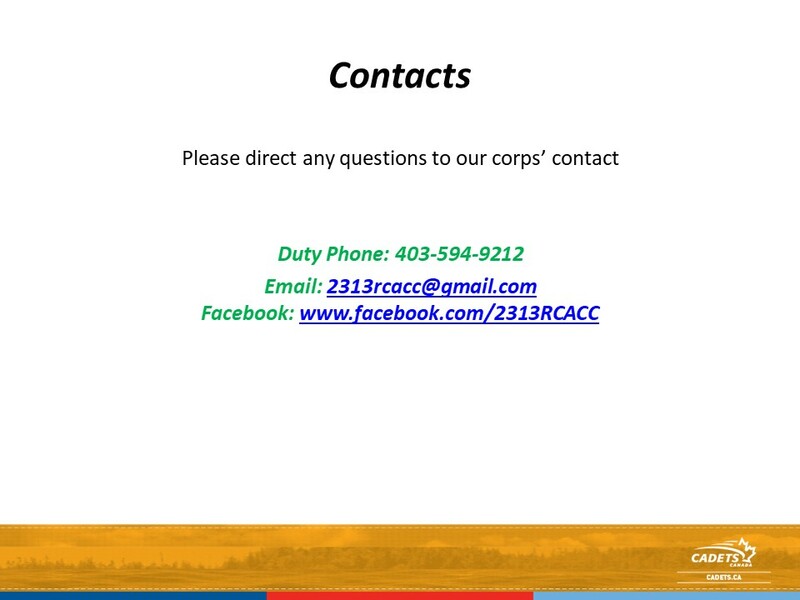 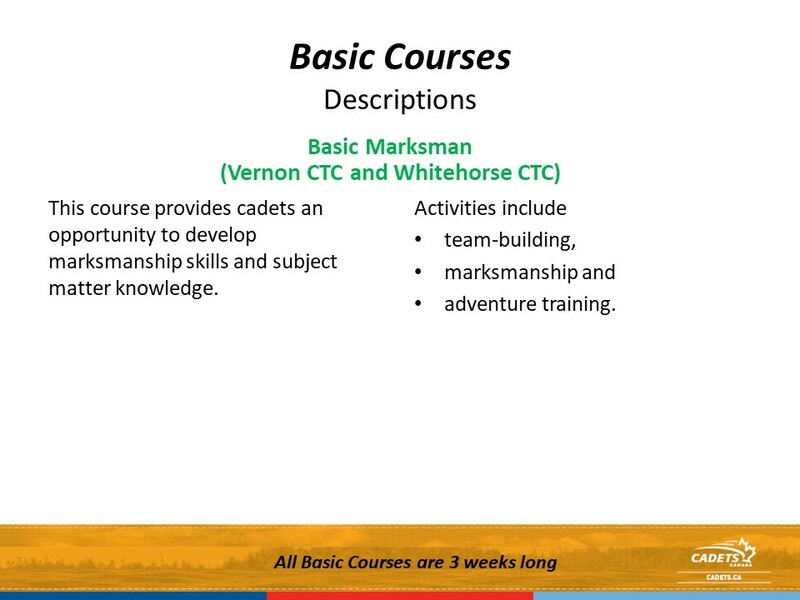 Cadets who report for summer training and are found not to meet course prerequisites may be re-coursed or returned to unit, at the discretion of the CTC CO.
A training bonus of $10 per day is paid to every cadet for each day of training they complete (to a weekly maximum of $60, and a course maximum of $360). 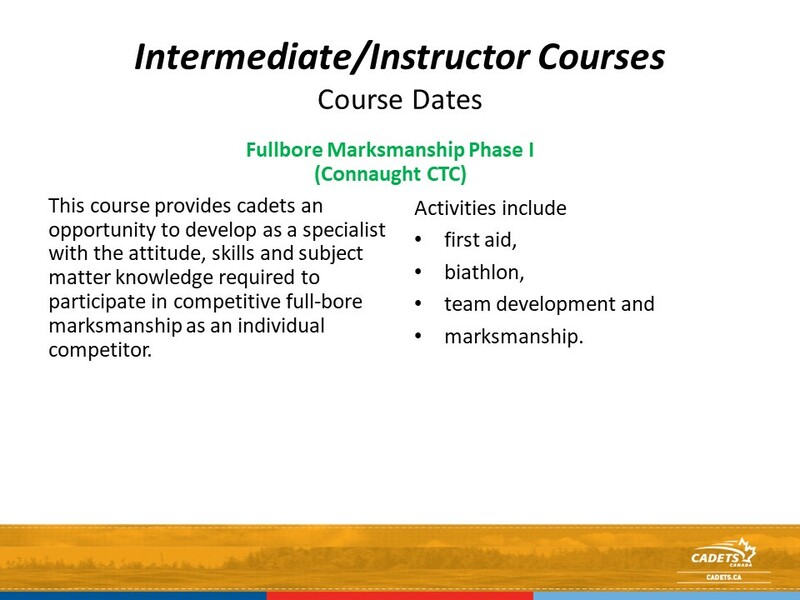 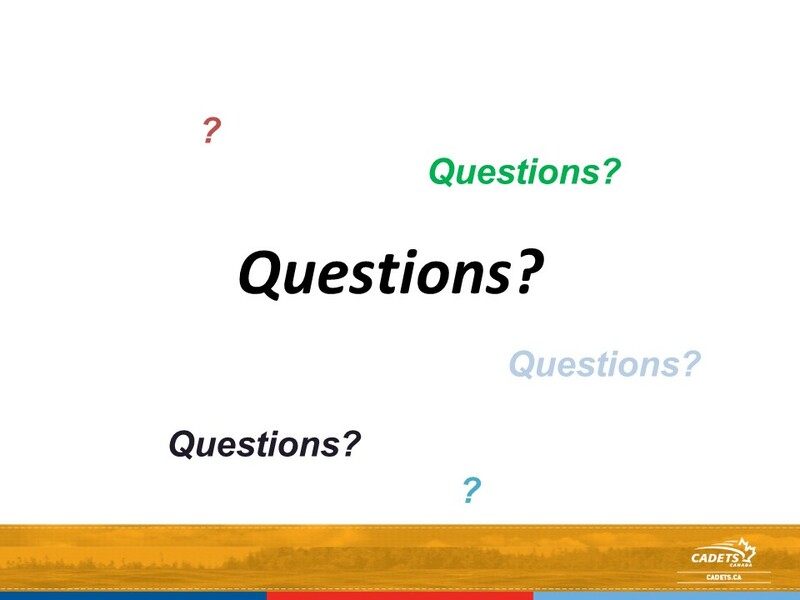 Depending on the course and CTC, this may be paid upon completion of the course, or portions of the bonus may be paid during the course. 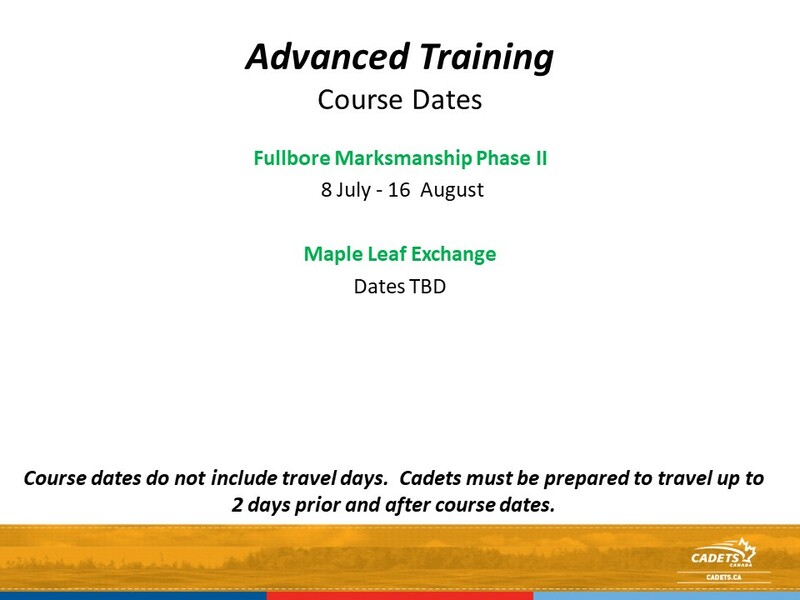 Note: Course dates do not include travel days. 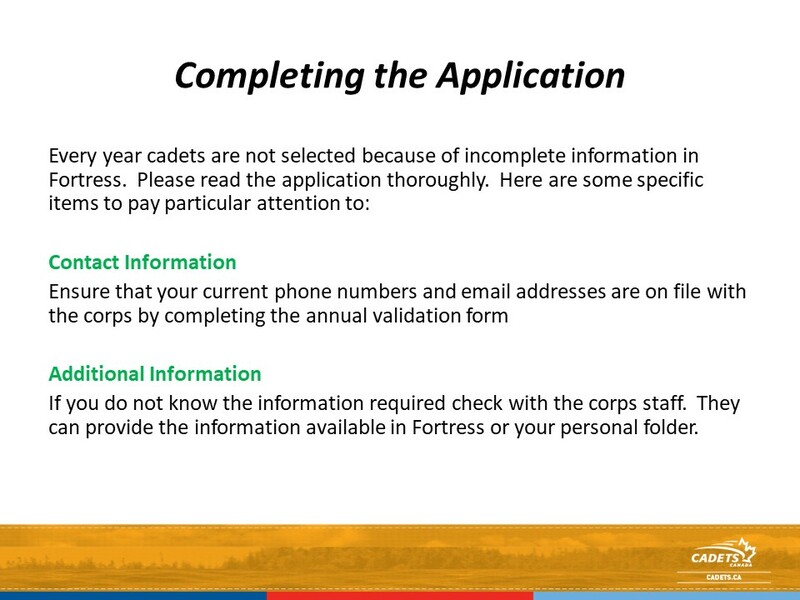 2018 Joining Instructions will be available June 2018. 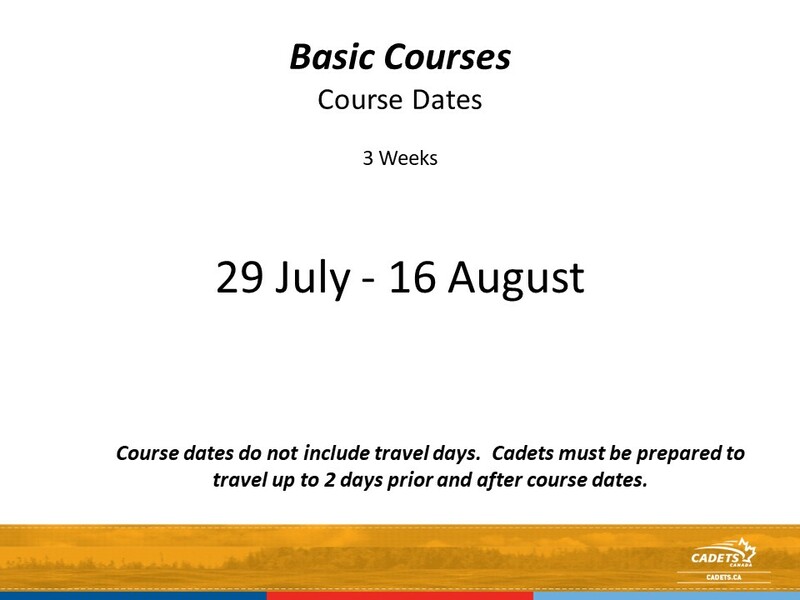 This two-week course is intended for cadets 12-13 years of age who have completed their first year of cadet training. 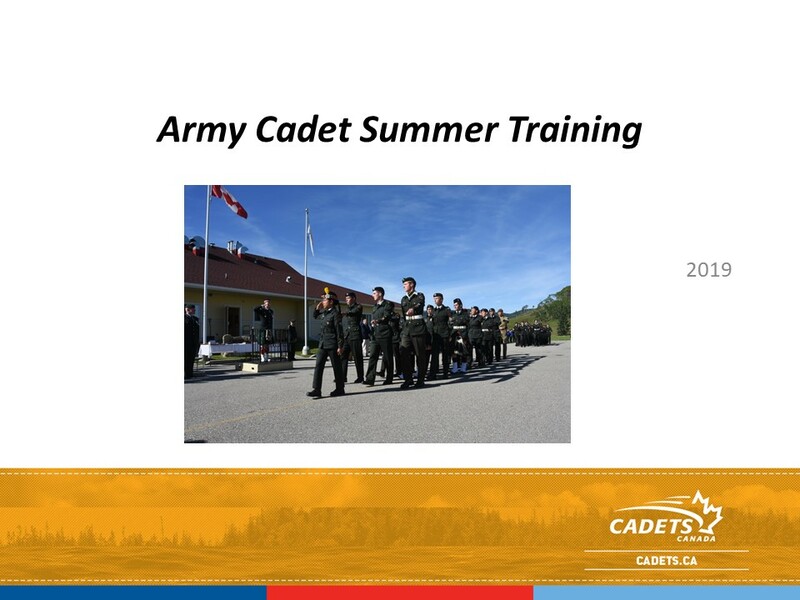 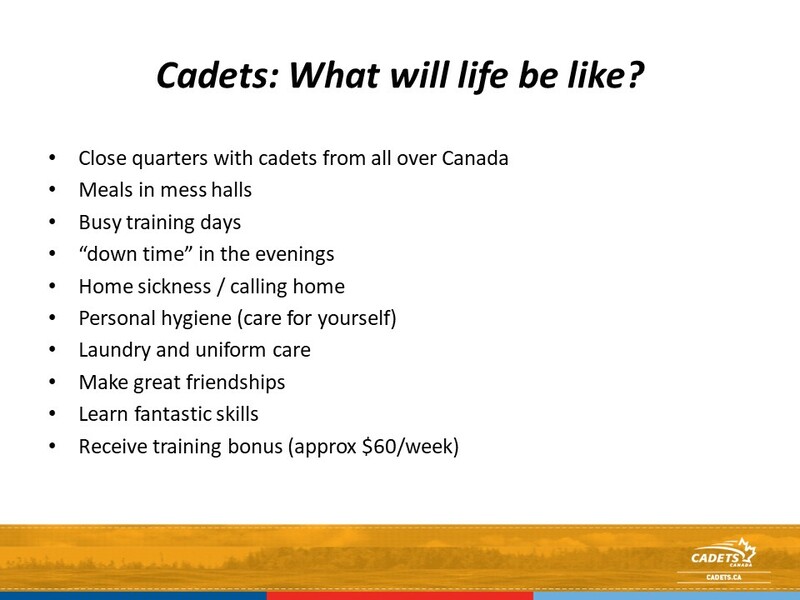 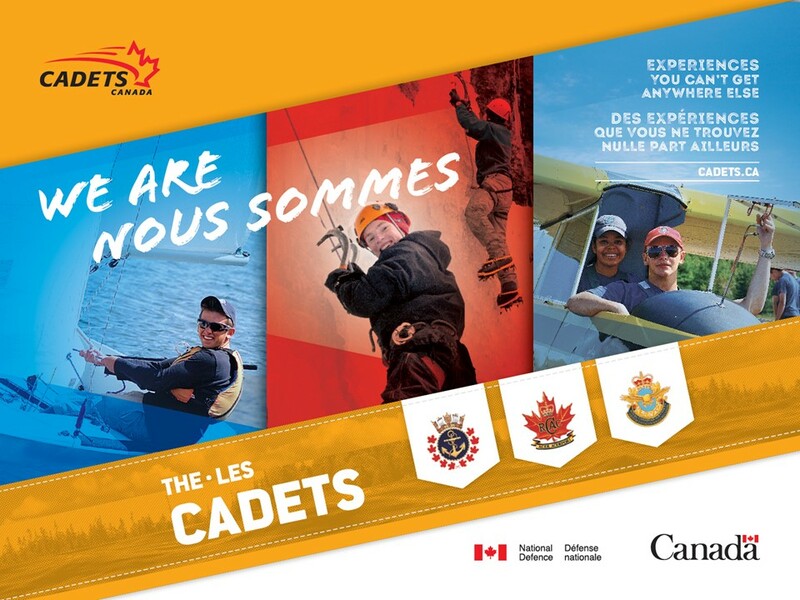 It introduces the cadet to life at a cadet training centre (CTC) with a focus on the opportunities available through Army Cadet Summer Training. 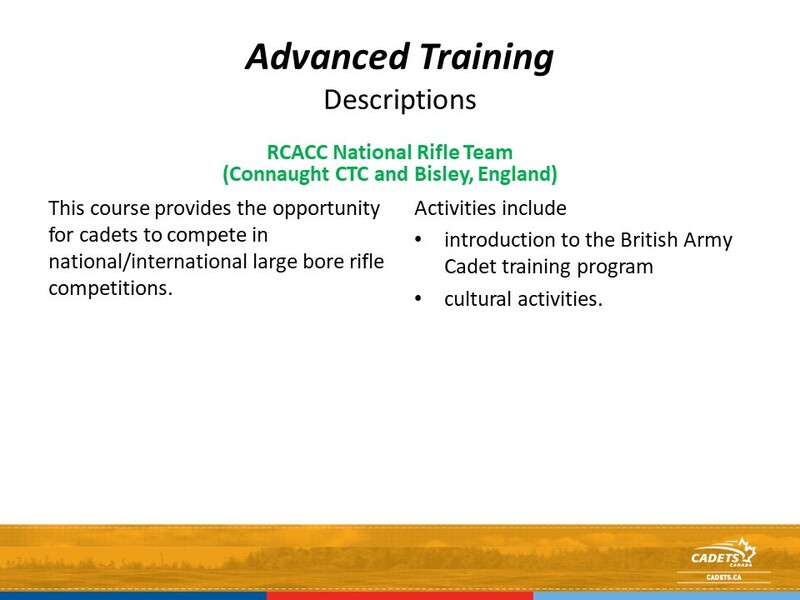 Activities include: a field exercise, team-building, air-rifle range, adventure training, tours, recreational sports, swimming, music training, general knowledge and citizenship. 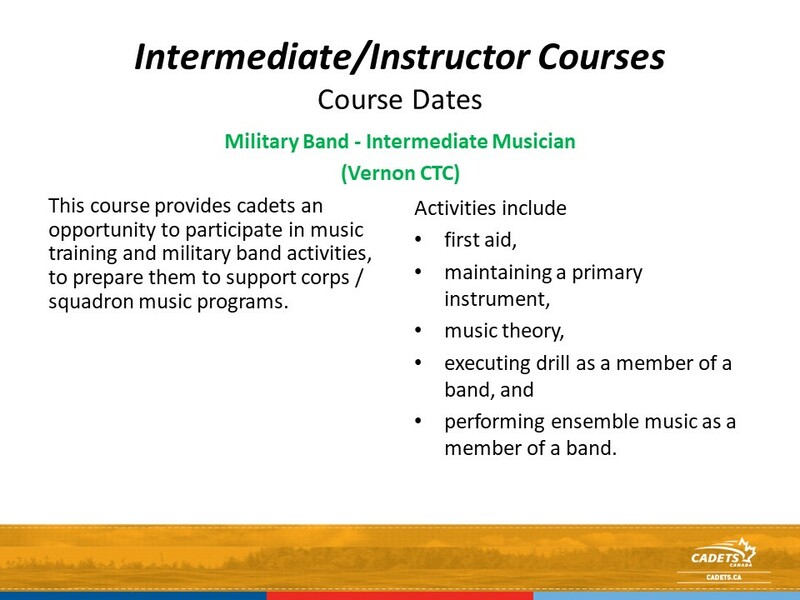 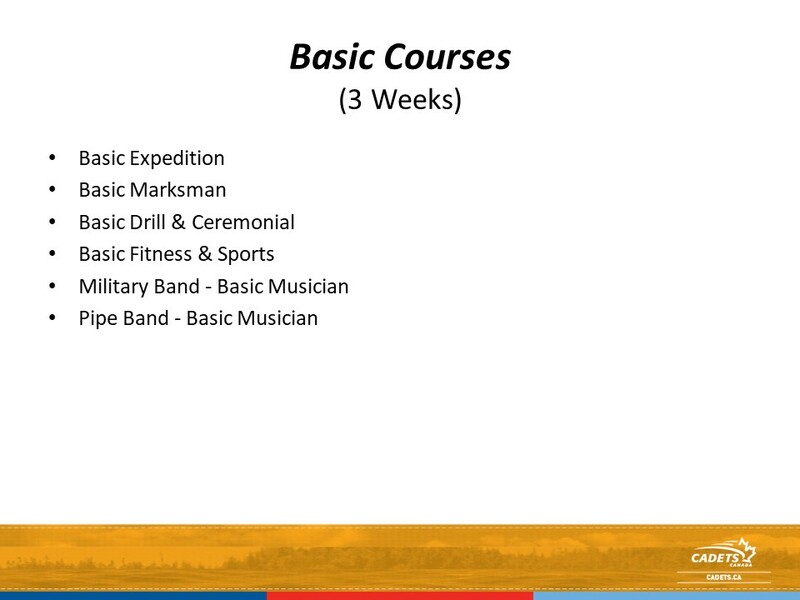 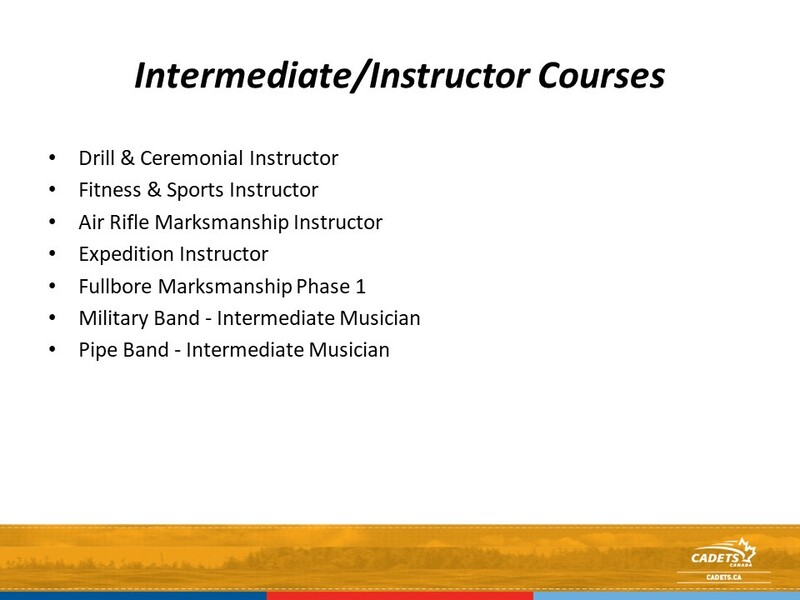 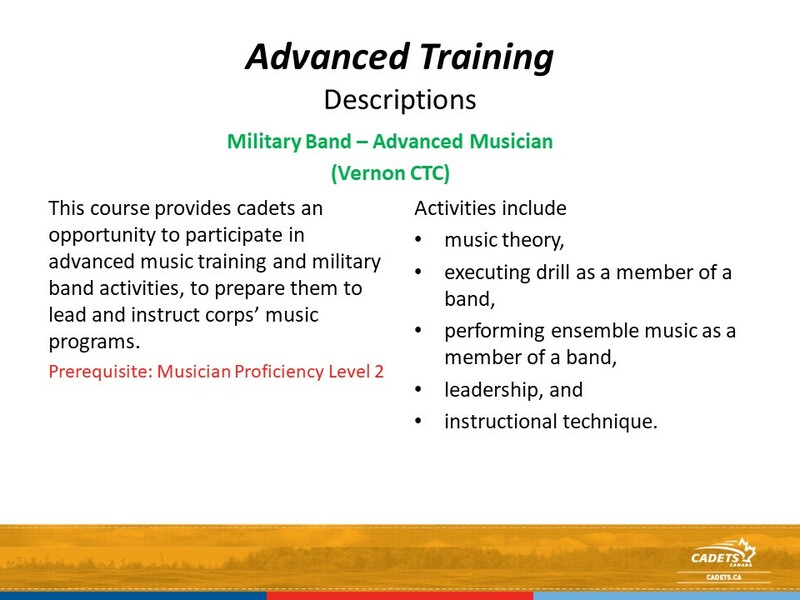 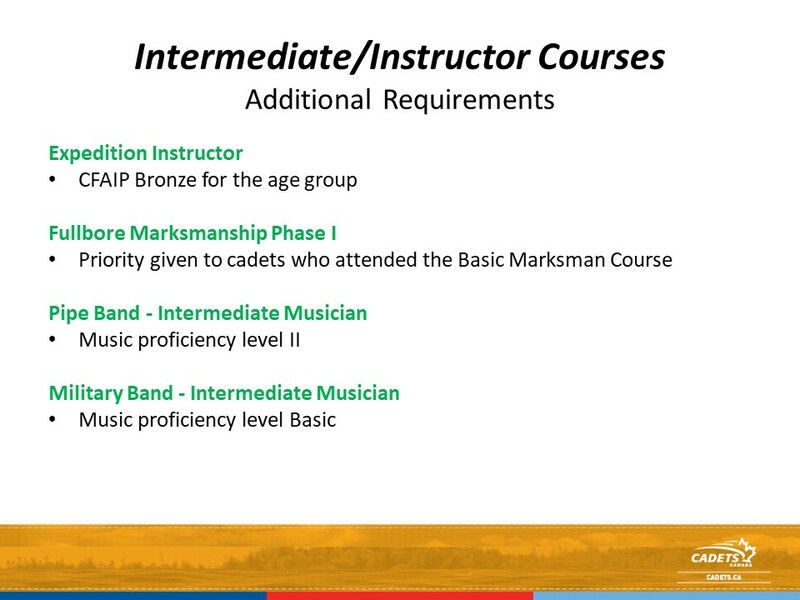 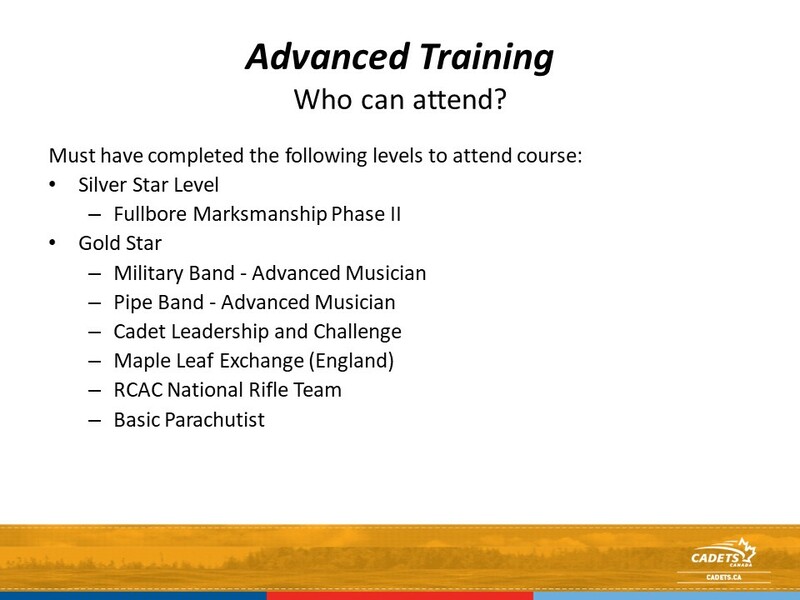 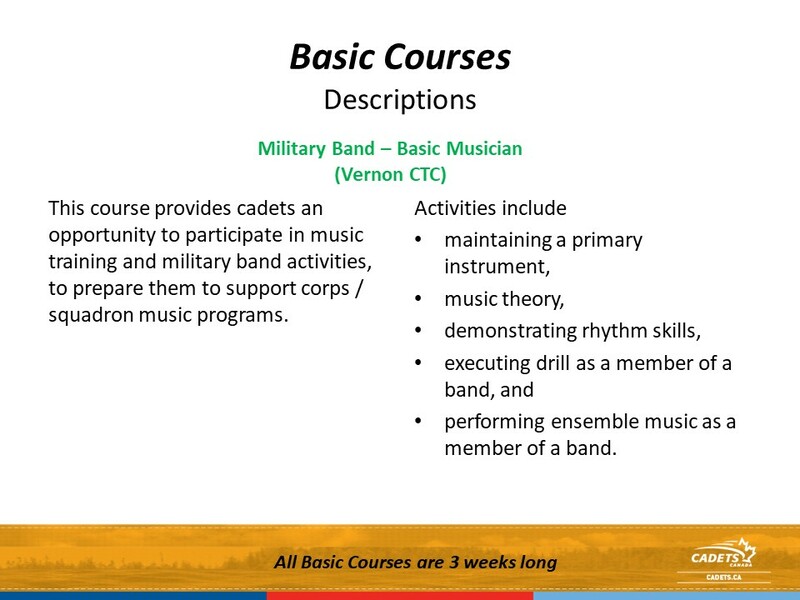 The aim of this course is to develop the music proficiency of cadets and prepare them to support their Corps bands and related music activities. 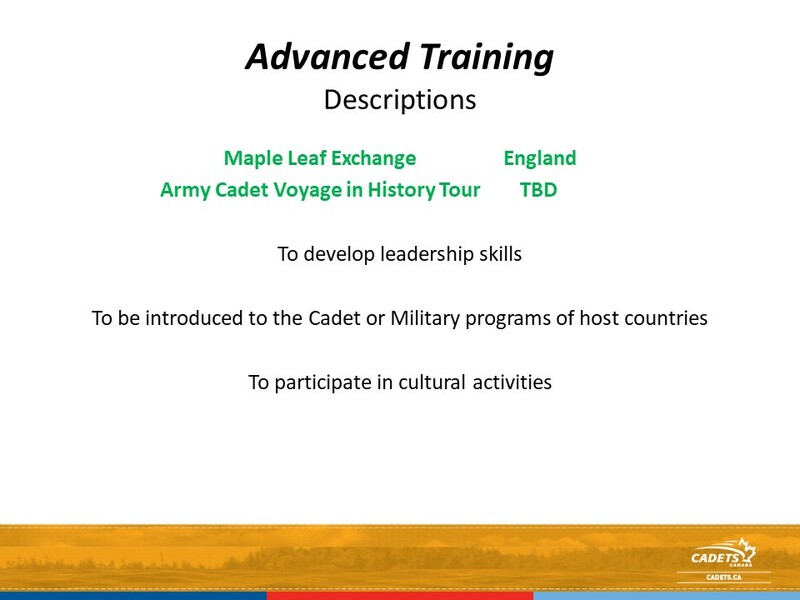 As well, they will experience some aspects of Army Cadet training to help them in their future course selections of the Army CTC program. 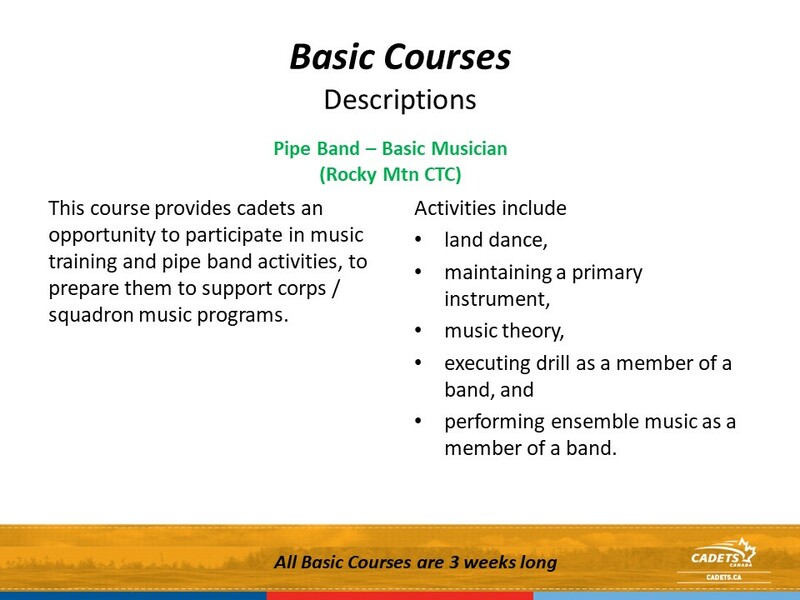 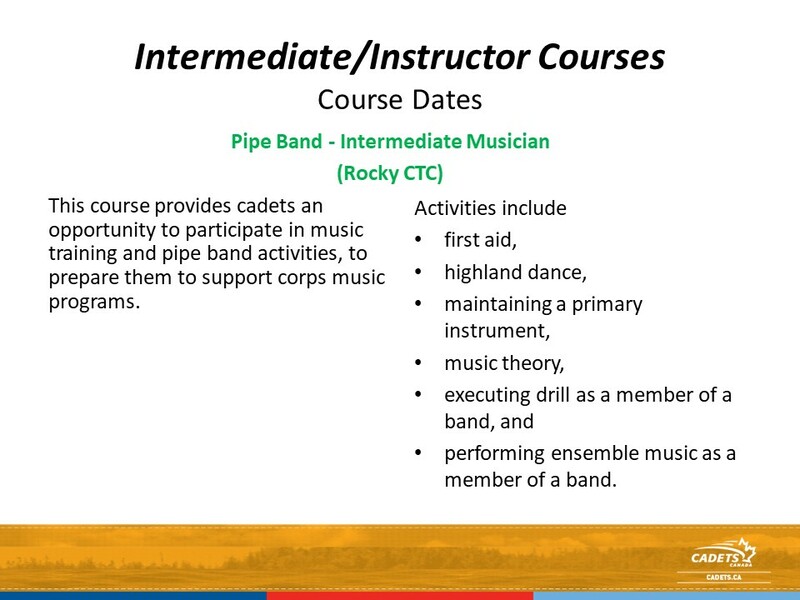 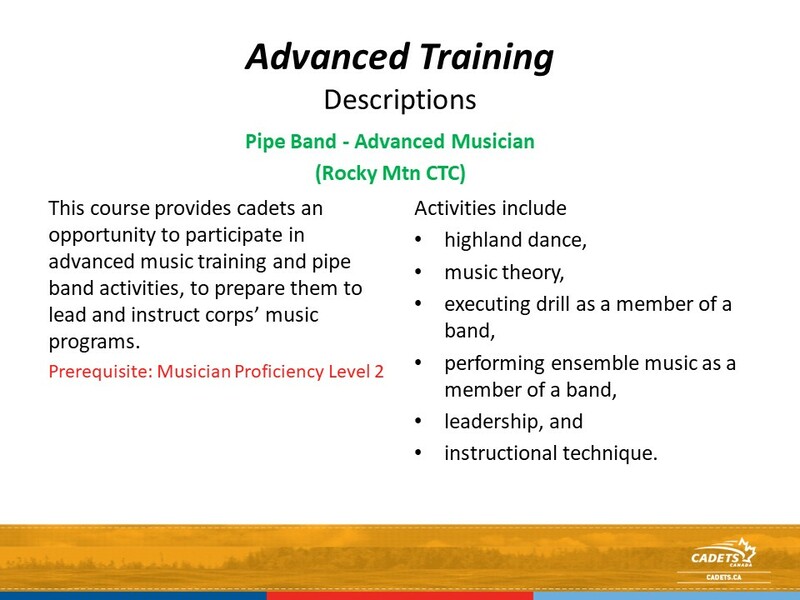 The aim of this course is to develop the music proficiency of cadets and prepare them to support their Corps Pipe bands and related music activities. 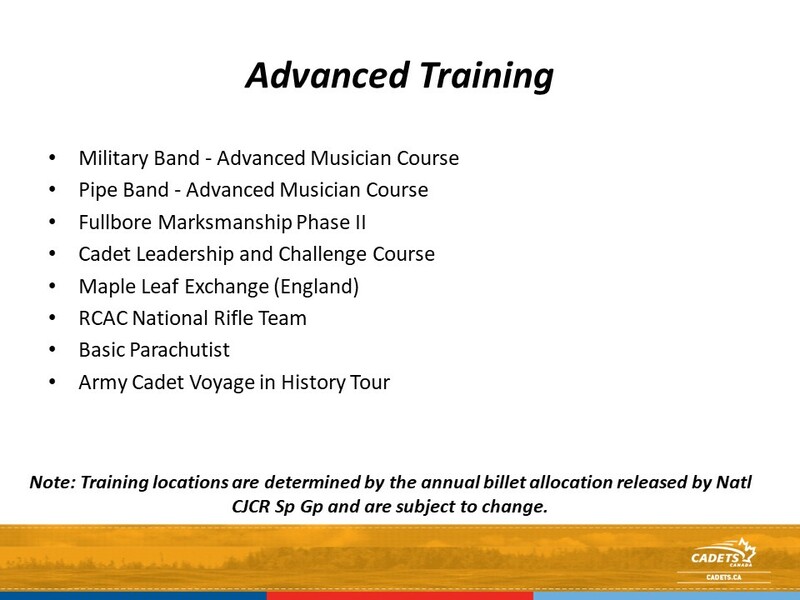 As well, they will experience some aspects of Army Cadet training to help them in their future course selections of the Army CTC program. 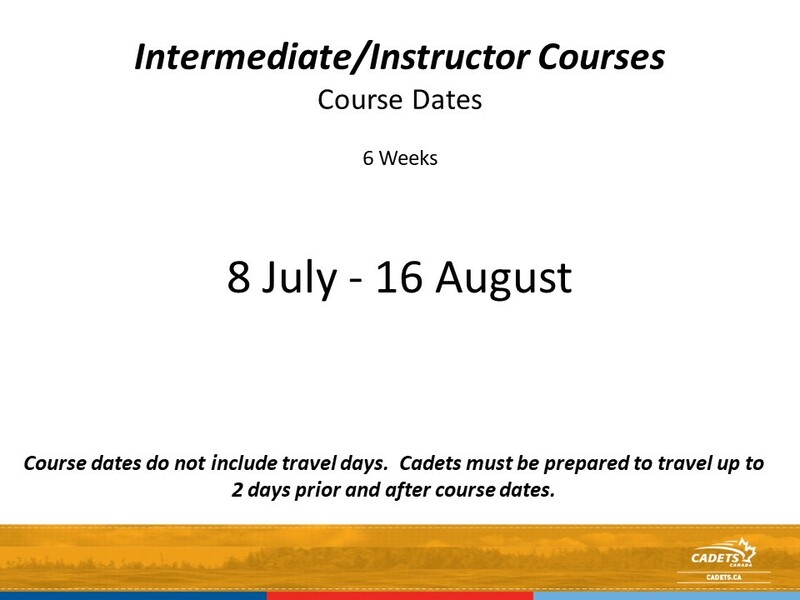 The aim of this six-week course is to develop a specialist with the skills and subject matter knowledge required to be an instructor for drill and ceremonial activities. 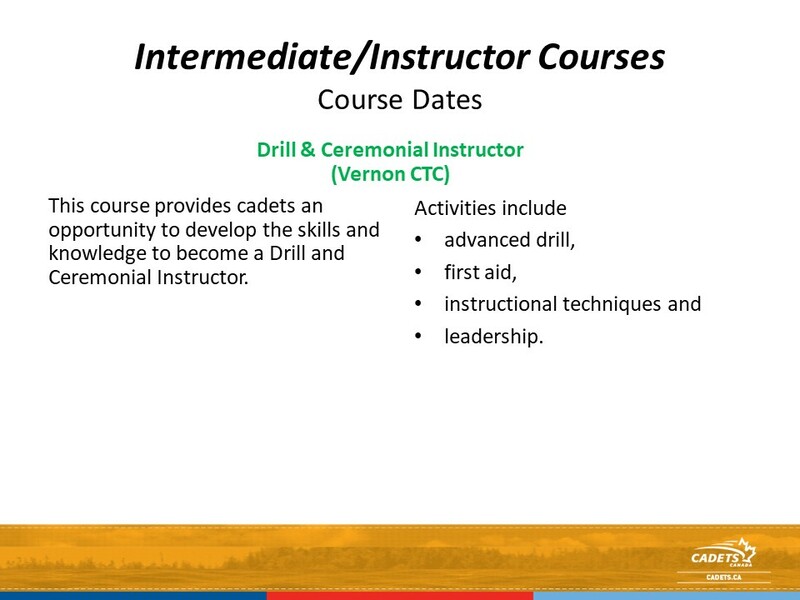 The aim will be accomplished by further developing drill and ceremonial related specialist skills and knowledge that will allow them to perform the duties of a specialist instructor for ceremonial activities. 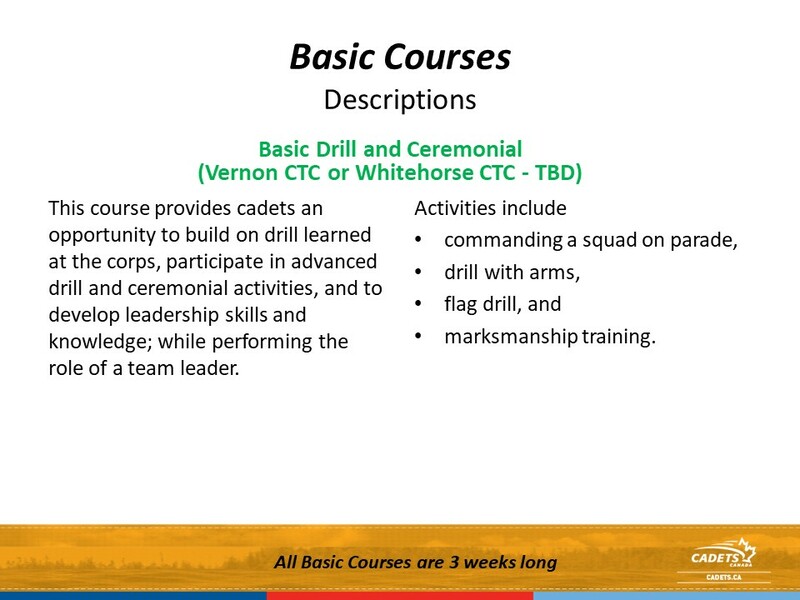 By establishing a dynamic learning environment that exposes the cadets to a variety of drill and ceremonial opportunities, this course will prepare the cadets to assume a specialist parade position at the Corps and CTCs. 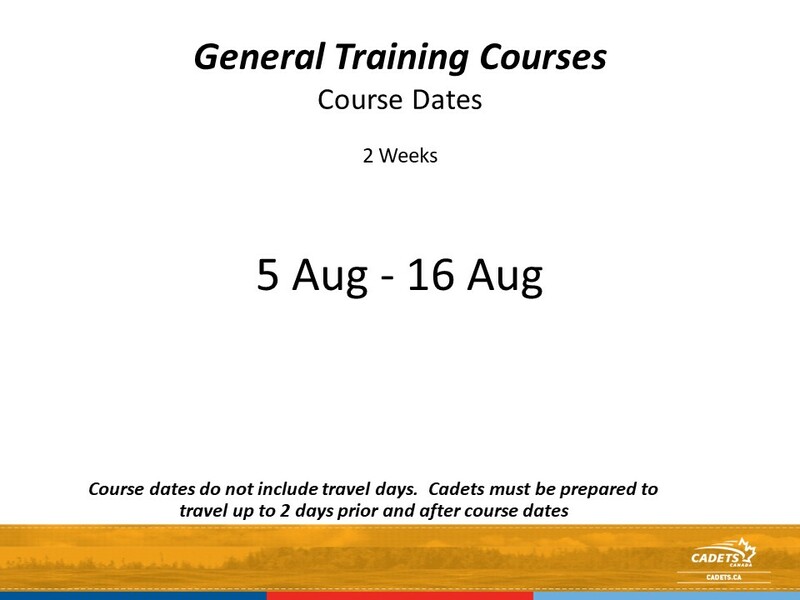 The aim of this six-week course is to develop a specialist with the skills and subject matter knowledge required to perform the role of a fitness and sports instructor and a team leader for fitness and sports activities conducted at the Corps, during regionally directed activities and/or as a staff cadet at a CTC. 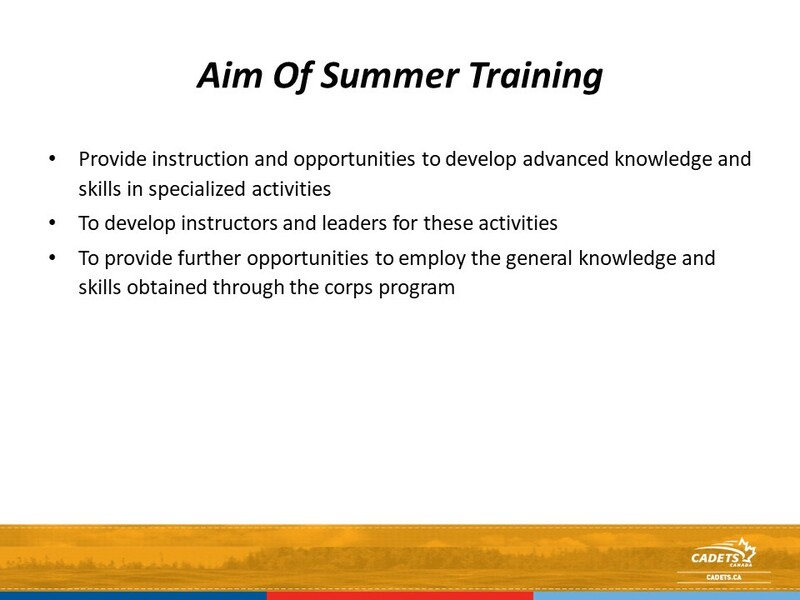 The aim of the course will be accomplished by providing dynamic and challenging training that includes ample opportunity for practical application. 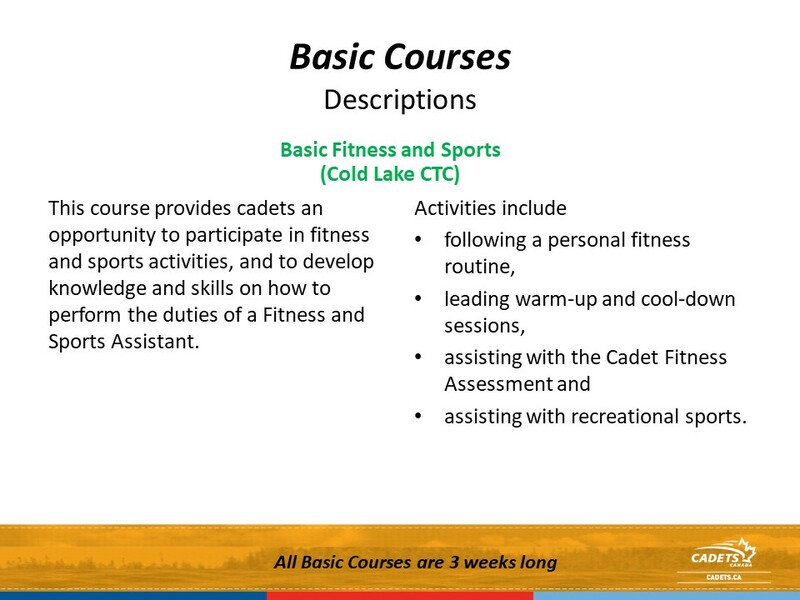 The cadets will learn theoretical and technical skills required to deliver the Corps physical education and recreational training program as specialist instructors. 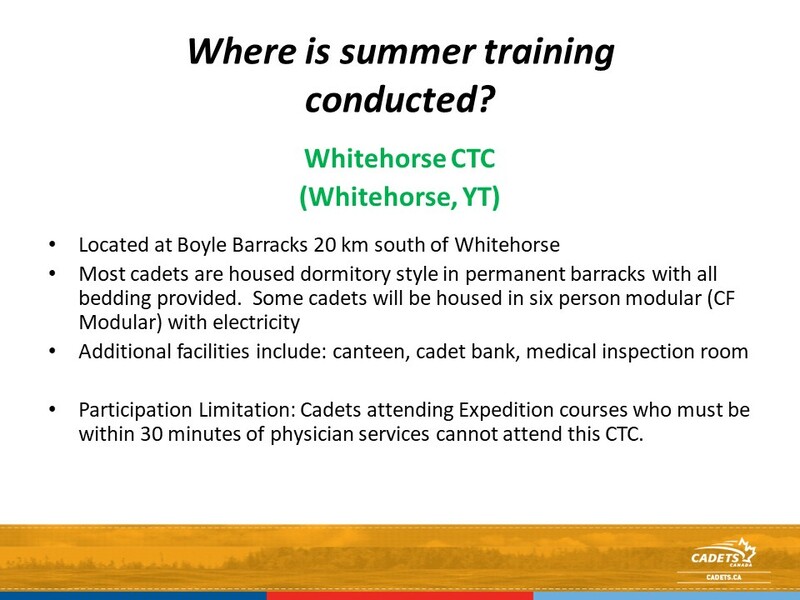 This course will ensure that the cadets are adequately prepared to face challenges at the Corps and as Staff Cadets at the CTCs. 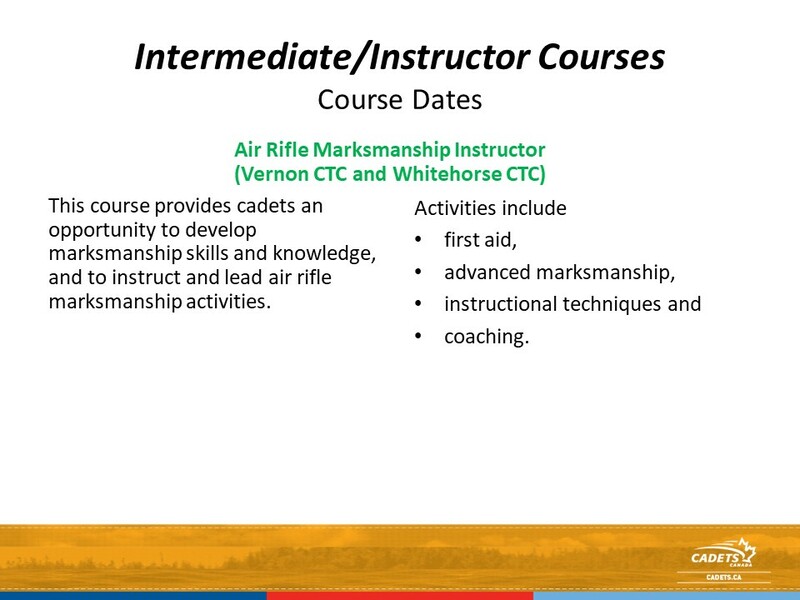 The aim of this six-week course is to develop individual air rifle marksmanship and summer biathlon specialty skills while reinforcing and further developing the leadership and instructional techniques skills preparing the cadets to support these two specialty activities at the Corps, during regionally directed activities and/or as a staff cadet at a CTC. 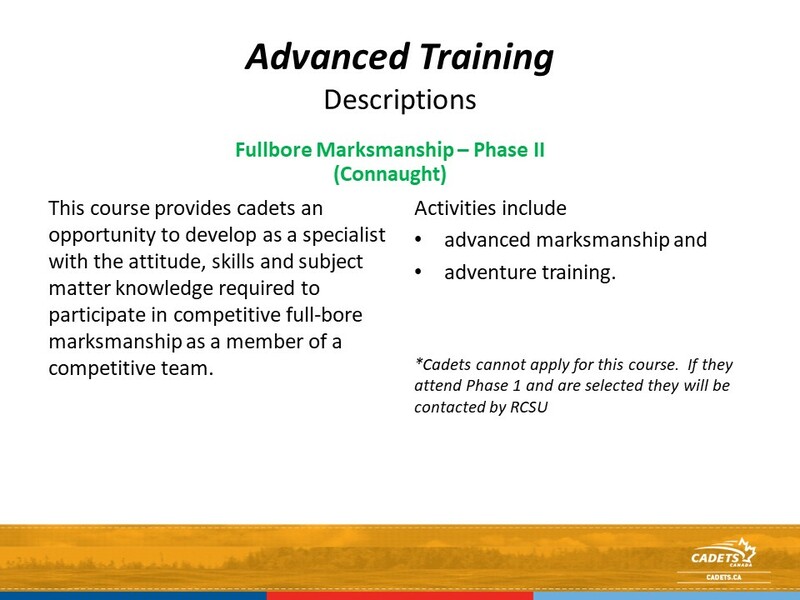 The cadet will be provided with the necessary theoretical, technical, and practical skills required to monitor and instruct other cadets during marksmanship training at the Corps. 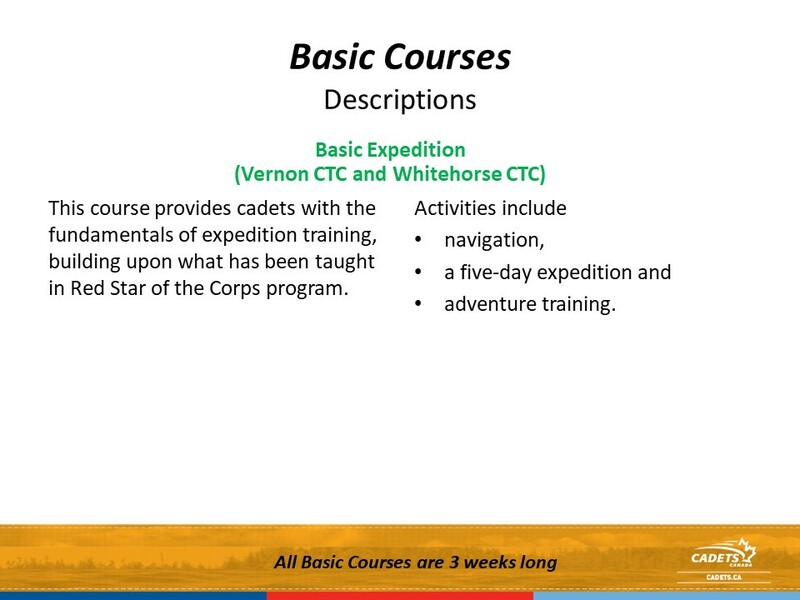 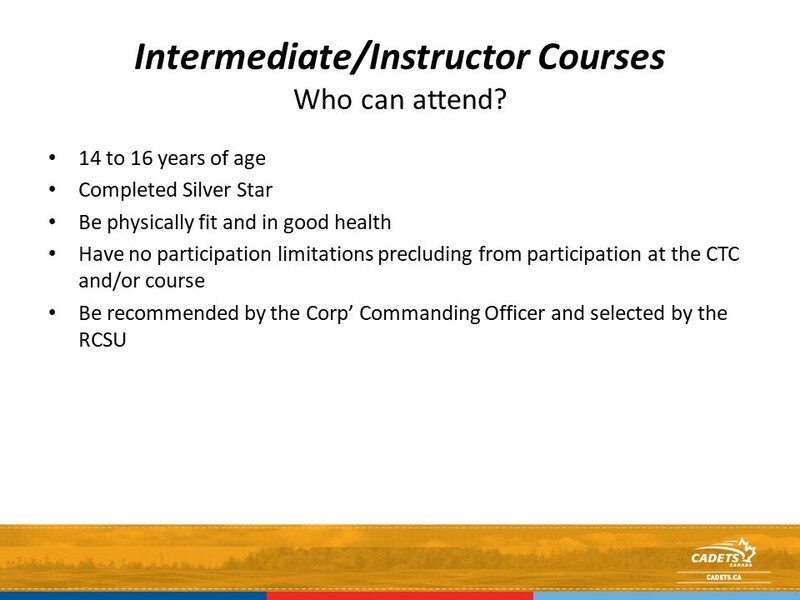 Prerequisites: Must be medically and physically fit, have no participation limitations which may preclude them from participating in intense level adventure training activities in remote locations and in high altitudes, have achieved minimum the Bronze Level of the Cadet Fitness Assessment Incentive Level, be motivated to pursue outdoor leadership and adventure training activities, have completed Gold Star training by 30 Jun. 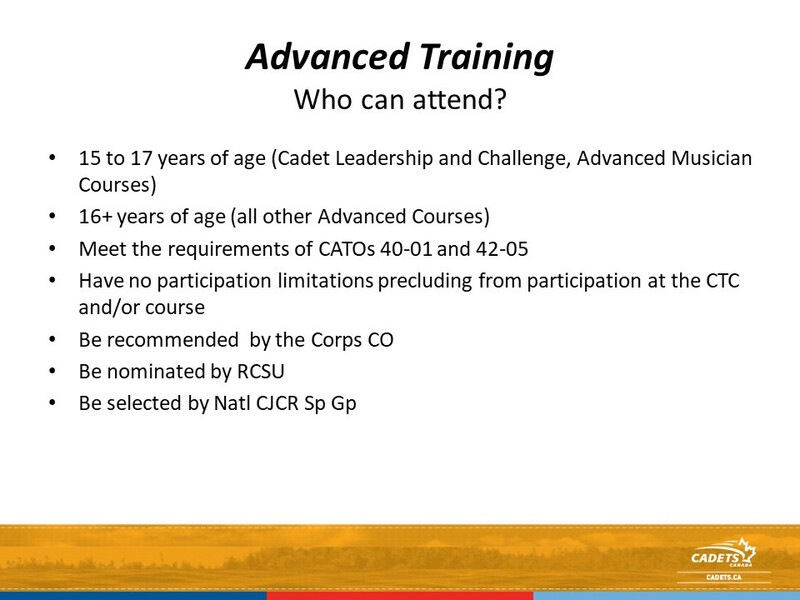 Priority will be given to those cadets with a higher ranking in the National Star of Excellence (NSE). 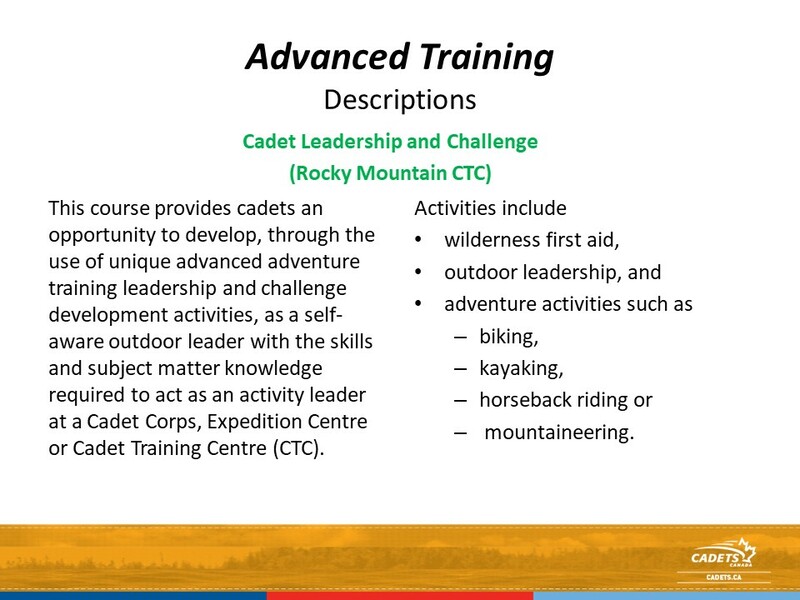 Prerequisites: Must be medically and physically fit, must be 16 by the start of the exchange, have no participation limitations which may preclude them from participating in intense level adventure training activities in remote locations overseas and in high altitudes, have achieved minimum the Bronze Level of the Cadet Fitness Assessment Incentive Level, be motivated to pursue outdoor leadership and adventure training activities, have completed Gold Star training by 30 Jun. 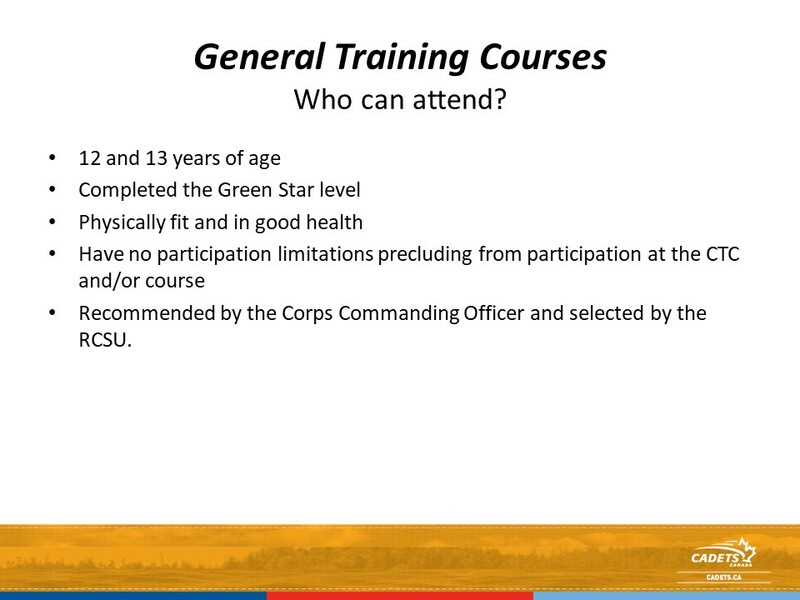 Priority will be given to those cadets with a higher ranking in the National Star of Excellence (NSE). 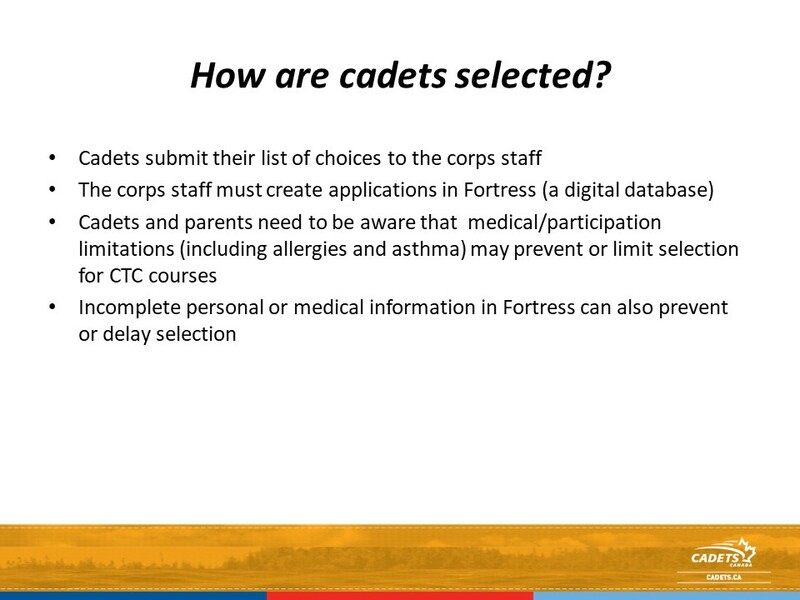 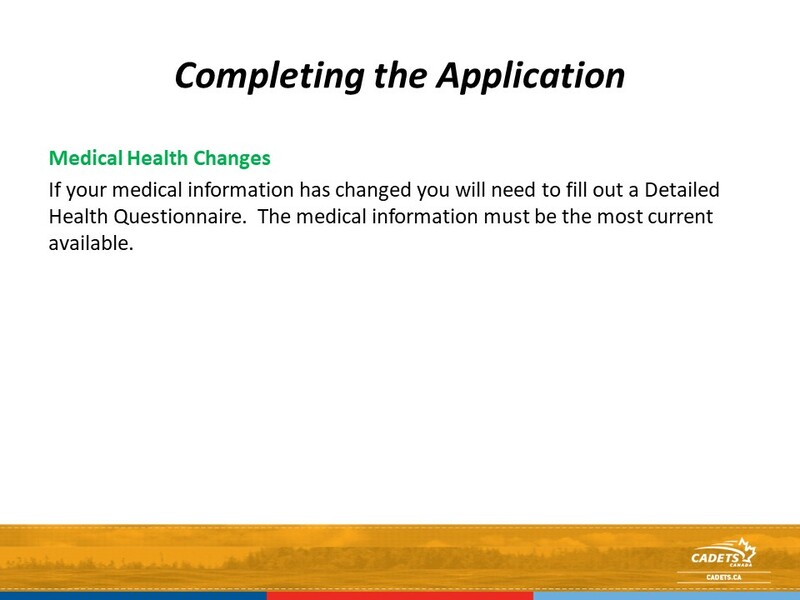 Prerequisites: be certified by a CF medical officer as being physically and mentally fit, must be 16 by 1 July of year of training and shall not have reached the age of 19 during the course, have no participation limitations which may preclude them from participating in intense level physical training activities in remote locations and in high altitudes, have achieved the minimum fitness requisite of 31 sit-ups & 7 chin-ups & a 1600 meter run in under 7:30 minutes, be motivated to pursue Parachute training activities, have completed Gold Star training by 30 Jun. 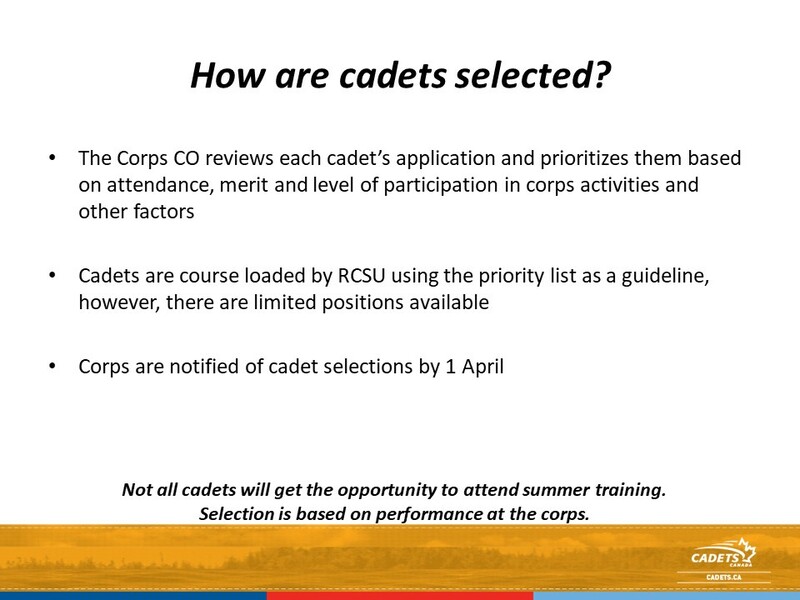 Priority will be given to those cadets with a higher ranking in the National Star of Excellence (NSE). 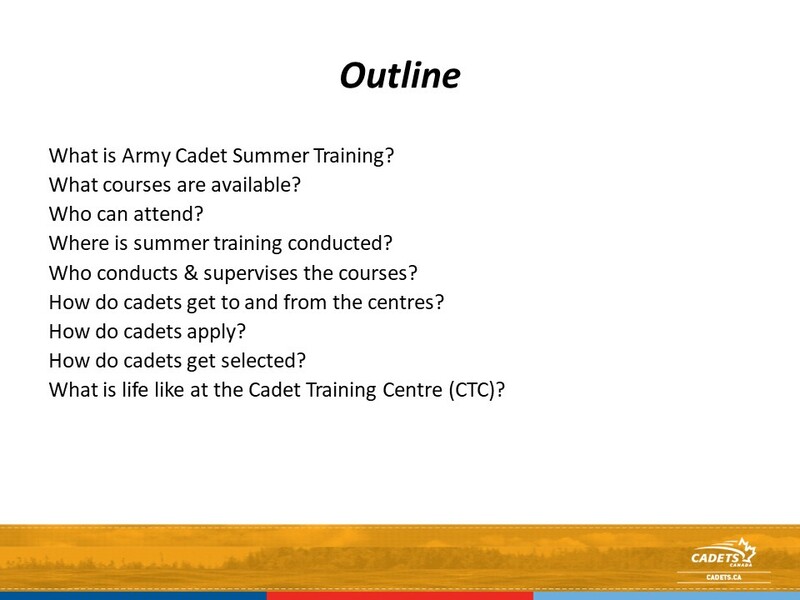 Staff cadets are the NCOs of the Cadet Training Centres. 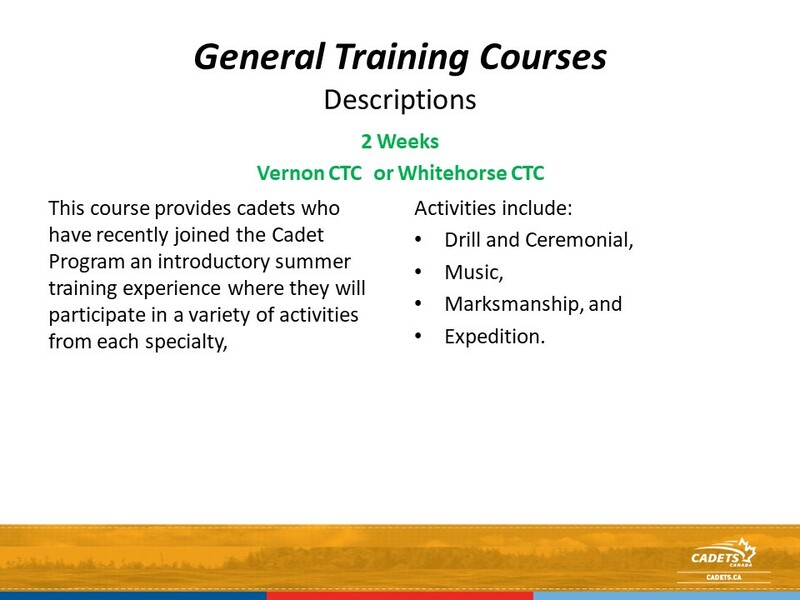 A staff cadet can assist the officer staff with the instruction and supervision of cadets, or might be tasked in an administrative or logistical support role. 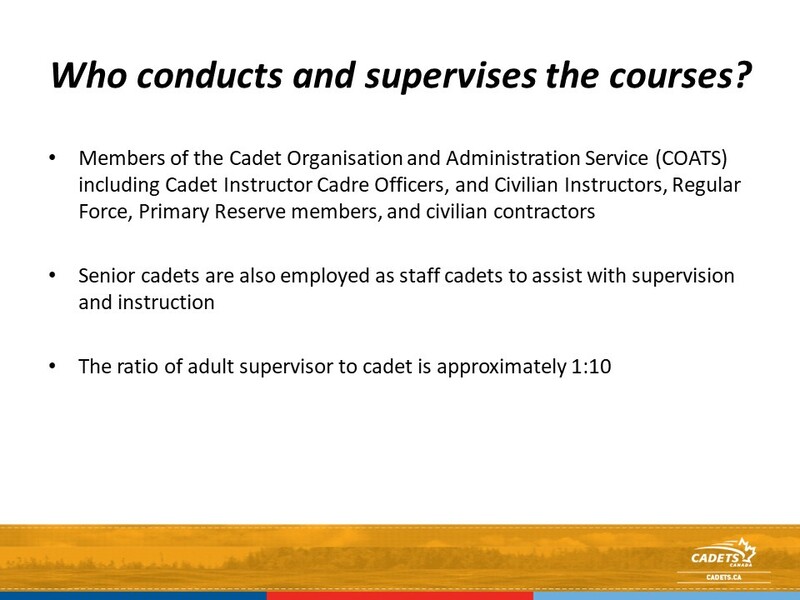 Rank and pay for staff cadets depend upon the position; this is usually determined during a pre-course training and evaluation period. 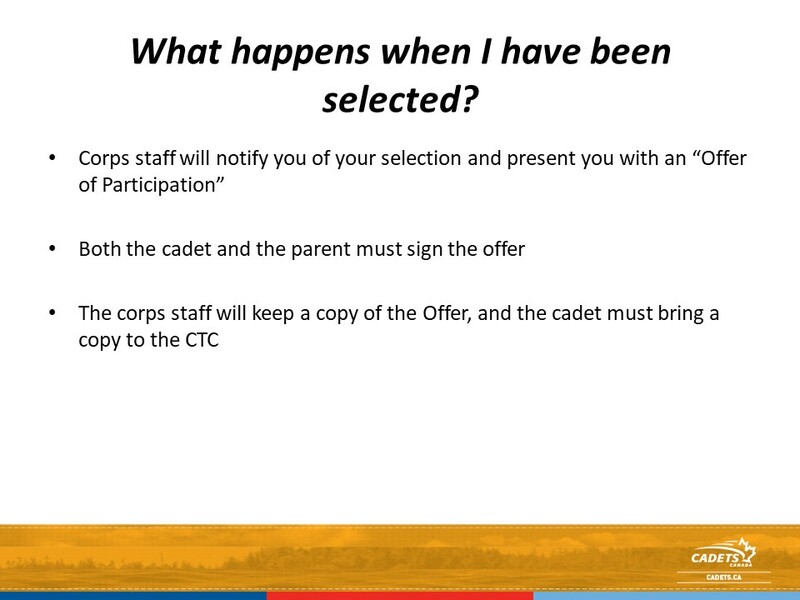 A staff cadet applicant must be at least 16 on 1 Jan 15. 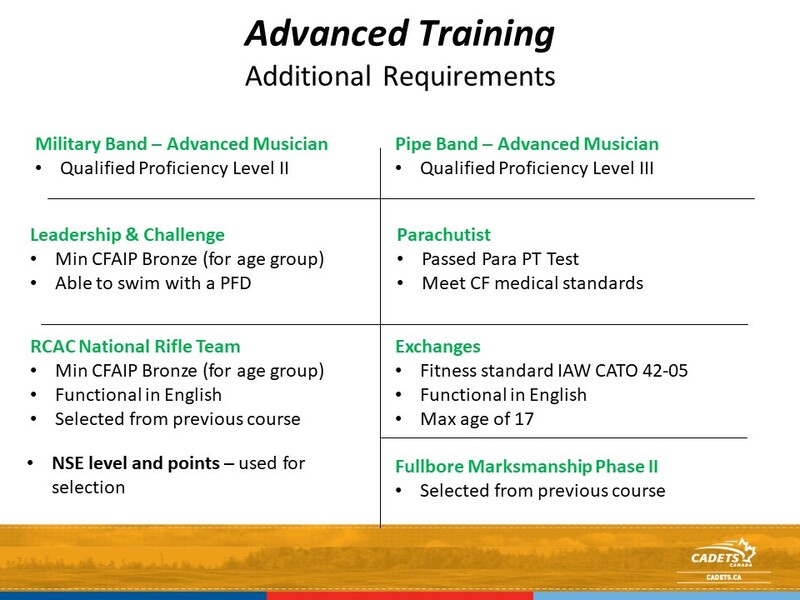 What is your level of proficiency in English?